U.S. Bellows, Inc. fabricated four fabric expansion joints for a gas turbine exhaust. They are 136″ L x 54″ W 12″ face-to-face. The frame and liner are fabricated from stainless steel and the fabric belt is 1-ply PTFE. 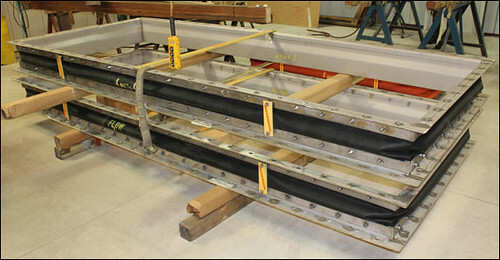 The expansion joints are designed for 400°F at +/- 100″ water column. A dye penetrant examination was preformed prior to shipment. Listen to in-depth explanations on how to choose the type of expansion joint that will best suit your system. Learn about the bellows movements throughout the piping system due to thermal changes of mechanical motion. Increase your understanding of the different types of expansion joints and value-added services offered by U.S. Bellows. 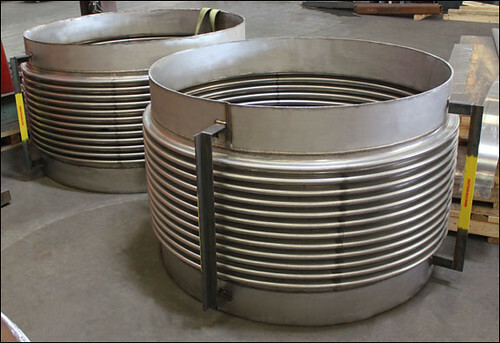 These single expansion joints are custom designed for an internal reactor in a propylene process unit. They are fabricated with Incoloy 800H bellows and A-240 type 304H stainless steel weld ends. The expansion joints range in diameter from 59-7/15″ to 78-8/8″ and are 41-5/16″ long. They were designed for a lateral movement of 0.25″, axial movement of 2.64″ and 15 psig at 1231°F. PMI, x-ray and dye penetration tests were performed prior to shipment.